David Beaulieu. The Spruce, 2008. Plant taxonomy classifies Tricolor sage plants as Salvia officinalis 'Tricolor.' The cultivar name, 'Tricolor' derives from the fact that the plant's foliage boasts three colors: white, green, and purple. The Salvia genus belongs to the mint family. Tricolor sage is a perennial herb. It is herbaceous at the colder end of its hardiness range (see below). But in the warmer parts of its range, its foliage is evergreen. 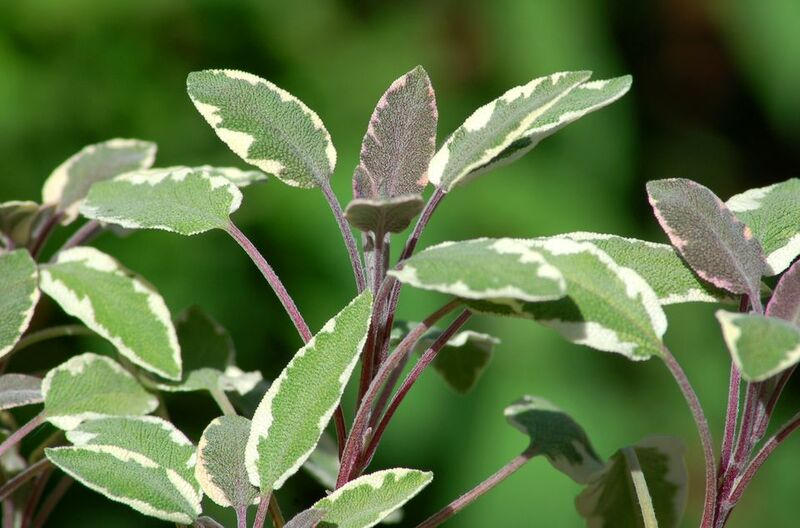 Although Tricolor sage plants do put out violet-colored blooms, they are often grown more for their variegated foliage. The older leaves on this herb tend to be green in the middle, with an irregular white margin; the younger leaves are purplish. These fragrant plants reach a height of 1-1 1/2 feet, with a similar spread. Indigenous to southeastern Europe, Tricolor sage is grown as a perennial herb in planting zones 6-9. This variegated cultivar is not quite as hardy as plain old Salvia officinalis, though. Grow these herb plants in full sun and well-drained soil. Mix in compost to improve soil fertility. If the foliage fails to receive sufficient amounts of sunshine, there will be less purple in the tricolored mix. As with most herbs, special attention should be paid to the requirement for well-drained soil. Tricolor sage plants are drought-tolerant perennials once established. Even though this herb is highly ornamental, it is also edible. So it still has the same culinary applications as regular sage. Also like its less colorful counterpart, it is reputedly effective in organic ant control (the ants do not like its fragrance). But its main uses are, no doubt, ornamental. For example, in rock gardens and knot gardens. Another use for ornamental sage would be to line the outside of garden stepping stone paths; to fill the cracks between, though, use herb plants that can stand up to foot traffic, such as creeping thyme. Sage has also been traditionally used medicinally. Its alleged health benefits account for the genus name, Salvia, which derives from the Latin word, salvere, meaning to be healthy. Divide these herb plants every three years or so to keep them vigorous. Cut back old vegetation in spring to make way for new growth. The herb, S. officinalis is perhaps best known for its culinary use in stuffing. S. divinorum is a hallucinogenic drug. S. splendens is that red salvia sold at garden centers, often right alongside other common annuals such as white alyssum and blue ageratum. It is among our most popular flowers for use as bedding plants.